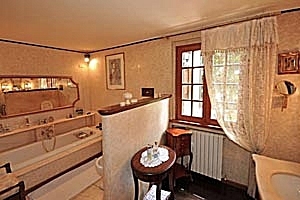 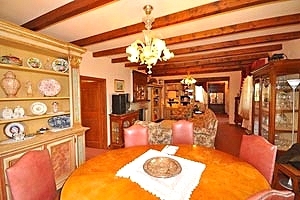 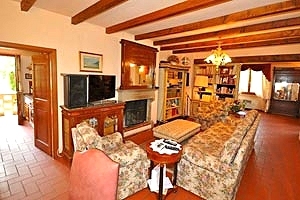 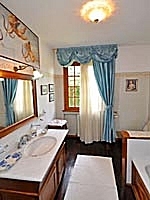 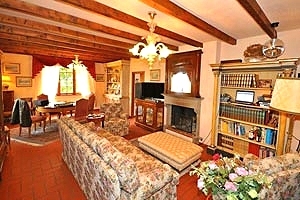 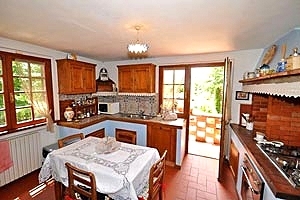 The villa is located in Valdichiana, one of the four valleys composing the province of Arezzo. 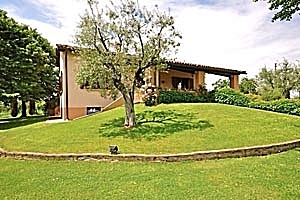 Valdichiana is renowned for being the place of origin of the famous Chianina breed. 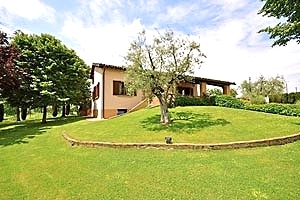 The valley is scattered with charming historic towns, such as Monte San Savino - with its partly Etruscan and partly Roman walls, its donjon and the imposing 14th-century tower -, the castle of Gargonza - which in 1304 hosted Dante Alighieri - and Lucignano - with its characteristic elliptical plan. 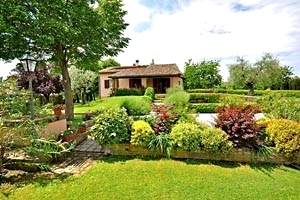 Situated near Monte San Savino, the villa is an excellent departure point for visiting many important cities of art in southern Tuscany, such as Cortona, Arezzo, Montepulciano, Montalcino, Pienza and Siena. The thermal towns of Chianciano Terme and Rapolano Terme are within short driving distance, as well. 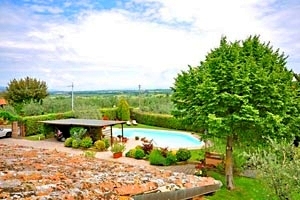 The fully fenced garden that surrounds the house features the private swimming pool (56 m²; depth: 1.20-1.80 m), the barbecue equipment and a wooden gazebo. 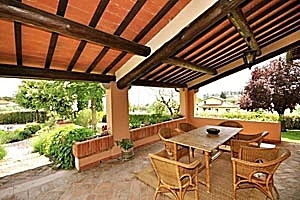 A covered terrace is equipped for dining in the open air. 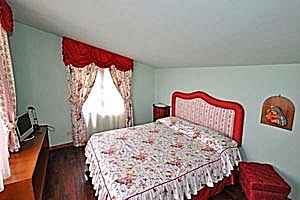 The two-storey building can accommodate 9 guests in 1 bedroom with a French-size bed, 3 double bedrooms and 1 double sofa bed, and has 3 bathrooms. 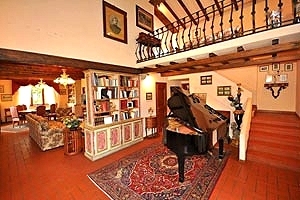 The mezzanine ground floor composes of entrance hall with piano, kitchen, living room with dining area and fireplace, a bedroom with a French-size bed, two double bedrooms and two bathrooms with shower. 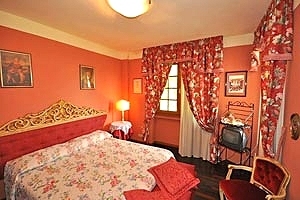 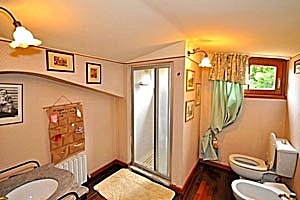 On the first floor are a living room with a double sofa bed, a double bedroom and a bathroom with shower. 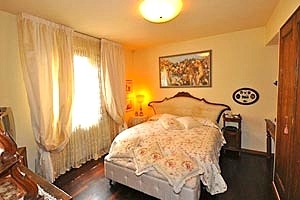 The bedroom on the first floor has an access to a panoramic balcony. 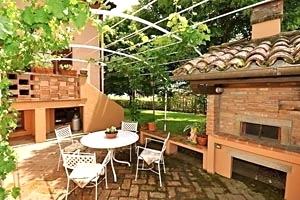 The villa comes with swimming pool, barbecue, fireplace, satellite TV, Internet connection, oven, freezer, microwave oven, dishwasher, washing machine, cot bed and private car parking place. 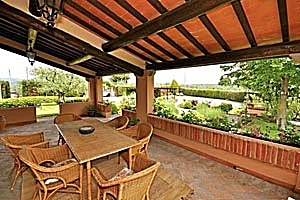 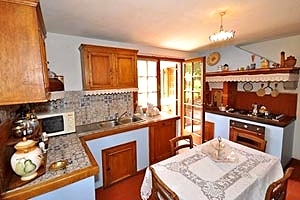 Dinners at the villa and Tuscan cooking lessons are organised upon request. 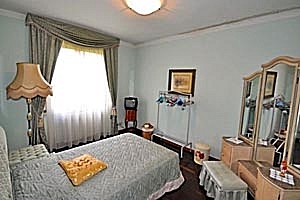 Shops and services of any kind are 1 kilometre from the property.